Hilaire Belloc wrote this travelogue of his journey, all on foot, starting in Toul, France, progressing through Switzerland, and ending eventually in Rome. He had taken this pilgrimage for the benefit of personal religious enlightenment. This book provides Belloc's witty and astute observations of the villages, towns, and people he encountered along the way in this part of Europe prior to World War I.
Belloc was a highly regarded Catholic prolific writer on such topics as history, religion, politics, and economics. The anniversary couple has a keen interest in both history and literature. 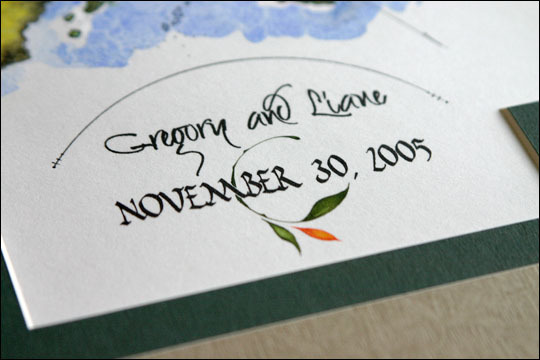 Each anniversary, the husband traditionally commissions a different calligrapher to render a piece that responds to these interests. 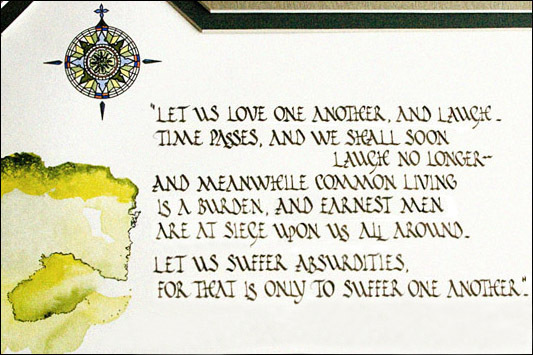 This particular piece parallel-represents their journey together in marriage with that of Belloc’s journey for enlightenment. 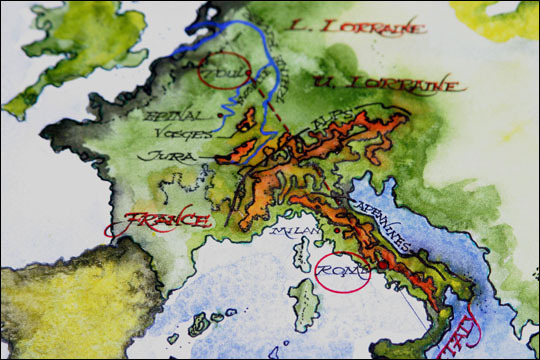 Gouache and watercolor were used for the map and compass rose, a ruling pen for the couple’s names, and a Mitchell roundhand metal nib #3 for the date and quotation (lettered in the Rustica hand). Salt crystals were sprinkled into the slightly wet watercolor and allowed to absorb the pigment, drying to create the textures found in the water and terrain. 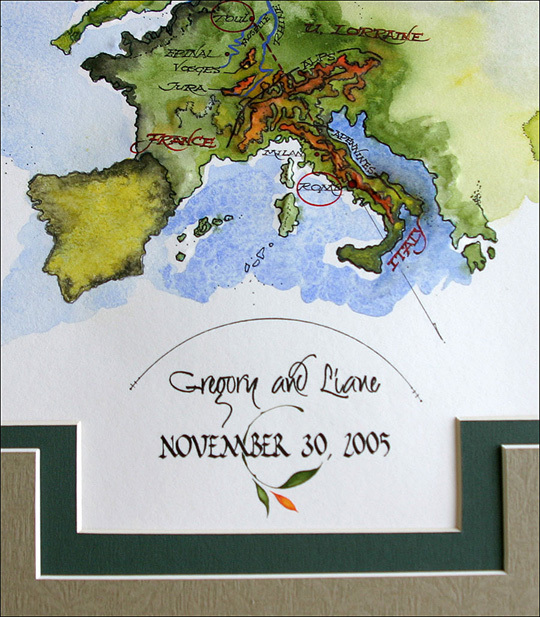 Though the photos do not readily show this following detail, the mountain ranges of both the Alps and the Apennines were emphasized further by hand-embossing the paper to provide a 3-dimensional quality. 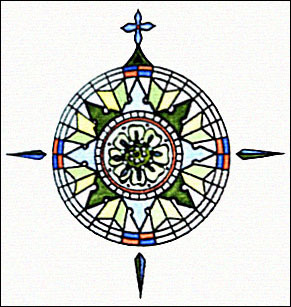 The double mats were die-cut to accommodate both the compass rose and the couple’s names and date.